Any illusions that we could see a mayoral horserace in 2017 were extinguished at yesterday’s lunch-hour mayoral all-candidates forum. Delivering their four minute introductory speeches in front of a group of roughly 120 people in the cavernous Shaw Conference Centre, it became fairly clear, fairly quickly, that none of the 12 candidate challenging Don Iveson in next month’s election have the skills, experience or even temperament to be a successful mayor. For the most part, the challengers delivered incoherent remarks, with many focusing on fringe issues that may have an audience on the internet, but don’t appear to have much traction off-screen. While some of them are earnest in their bids, the lack of experience and familiarity on municipal issues among the challengers was apparent. Two of the candidates, Carla Frost and Bob Ligertwood, had a weird confrontation on stage. An official from the Elections office apparently gave them a talking-to off stage before the speeches began. Fahad Mughal, who was the first candidate to enter the race against Iveson, was likely the best prepared of the challengers, though his campaign promises and criticisms of the incumbent do little to actually differentiate himself from the pack. I feel that Mughal could have a future in municipal politics, perhaps as a City Council candidate in 2021. If first impressions matter the most, the 12 candidates challenging Iveson should be thankful there were only 120 people in the room watching the speeches, because there was little to be impressed about. For his part, Iveson does not appear to be taking the lack of serious challengers for granted. He and his team are campaigning and have released a series of policies dealing with energy transition and climate change, building design and transportation infrastructure, and transparency at City Hall. Unless something major changes between now and October 16, 2017, Iveson should cruise to a sizeable re-election. That said, if politics has been characterized by one thing in the last 5 years, it is that an even a very unlikely outcome is still always possible. Note: I am a supporter of Don Iveson and played an active volunteer role in his election campaigns for city council in 2007 and 2010 and his successful bid for mayor in 2013. I do not have an active role in his re-election campaign this year. 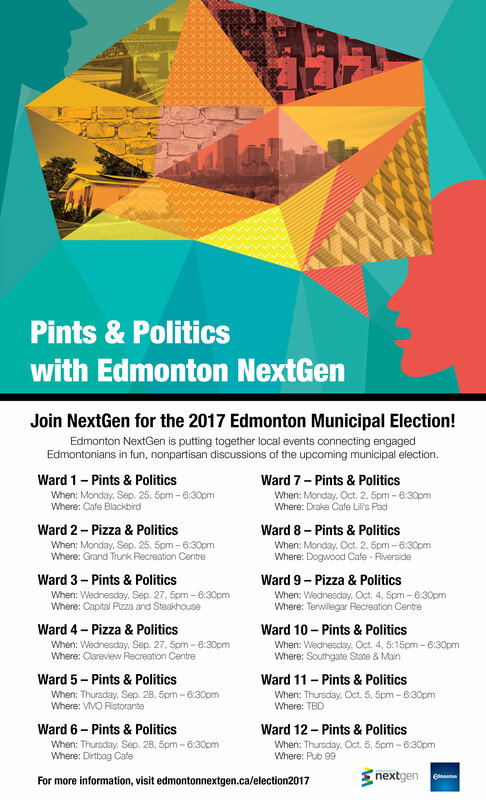 Edmonton Elections is organzing all-candidate forums in each of the city’s twelve wards and for the mayoral election and Edmonton’s Next Gen committee is organizing socials for young Edmontonians in advance of each of the council forums. This entry was posted in Alberta Politics and tagged Bob Ligertwood, Carla Frost, Don Iveson, Don Koziak, Edmonton Election, Edmonton Municipal Election 2017, Edmonton Next Gen, Fahad Mughal, Mayoral Election Forum, Shaw Conference Centre on September 27, 2017 by Dave Cournoyer. edmonton election 2010: deciding my vote in ward 6 & ward f.
There are now two weeks until Edmontonians have the opportunity to elect their Mayor, City Councillors, and School Board Trustees (either Public or Catholic). The polls will be open from 9:00am to 8:00pm on Monday, October 18. If you will not be able to vote on Election Day, you can take advantage of advanced voting until October 16 (open 11:30am to 5:00pm from Monday to Friday and from 9:00am to 4:00pm on Saturday). If you have yet to decide who will get your vote, there are many online resources available to help you make an informed decision. 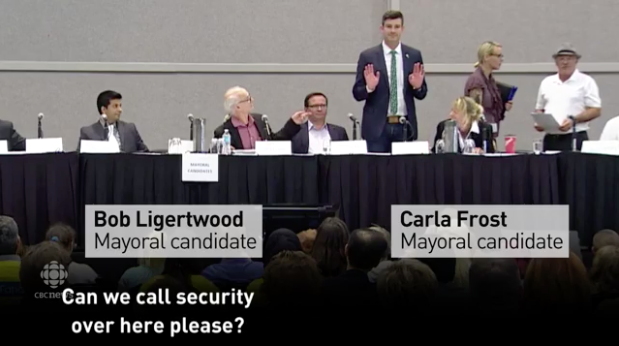 You can also watch video recordings of the City of Edmonton all-candidates forums that have already been held and those that will be held this week. Being a responsible citizen, I have been thinking a lot about the ballot choices I will make on election day. My vote for Public School Board Trustee was the easiest to decide. I will be voting for Ward F candidate Michael Janz. I have known Michael for a few years and know that if elected he will be a strong advocate for community involvement in the future of our public schools. For too long, our Public School Board has acted as a pasture for retired school principals and school board administrators and because of this it has withered into insignificance among the general public. I know that Michael understands this and believe that if elected as a Trustee, he will work to increase the relevance of our Public School Board beyond teachers, parents, and children. Marking an X beside Michael Janz was an easy decision for me, but do not let me stop you from reading more about Joanna Rozmus and Bev Sawyer. I am having a difficult time deciding what to do with my City Council ballot. I am feeling extremely underwhelmed about the candidates in the downtown Ward 6. I thought that tuning-in online to last week’s all-candidates forum might help me with my decision, instead it just increased my indecision. Incumbent Councillor Jane Batty is a nice person and as a Councillor she appears invisible on the issues. I pay attention to municipal politics and still have little idea what Councillor Batty has achieved during her three terms on City Council. I have also seen little existence of her campaign in this ward and have only spotted her election signs in front of her campaign office on Jasper Avenue and 122nd Street. Ward 6 challenger Bryan Kapitza’s ideas speak to me on paper, but that is not enough. After meeting the man in-person, I have serious questions about whether he has the personality to forge meaningful working relationships with other Councillors (which is essential if you want to achieve anything on City Council). Cris Basualdo appears to be running a campaign focused on the neighbourhoods of McCauley and Central McDougall (these two neighbourhoods are the only ones mentioned on her website). The other candidates all blend together. Wildrose Alliance caucus staffer James Johnson entered the contest late and has been running a fairly cookie-cutter conservative campaign. I honestly have very little to write about the other challengers, Carla Frost, Lee Permann, Adil Pirbhai, and Thomas Roberts. Considering the challenges and opportunities facing our downtown core neighbourhoods, it is pretty disappointing that this Ward was not able to attract a more dynamic group of candidates. With the election only nine days away, the candidates in Ward 6 will need to do something pretty spectacular in order to convince me not to spoil the Councillor section of my ballot. 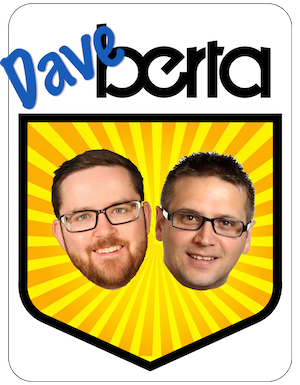 This entry was posted in Edmonton Politics and tagged Adil Pirbhai, Bev Sawyer, Bryan Kapitza, Carla Frost, Cris Basualdo, Jane Batty, Joanna Rozmus, Lee Permann, Michael Janz, Thomas Roberts on October 9, 2010 by Dave Cournoyer.